Staples makes it easy to get the supplies you need delivered right to your desk. Order their catalog today and start enjoying the benefits. 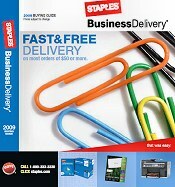 Order your FREE Staples catalog today! *J.D. Power and Associates has certified Staples® Customer Service as providing “An Outstanding Customer Service Experience” for the second year in a row based on customers’ positive feedback.